A 3 by 5 meters advertising billboard promoting the two of us is placed deep in the woods in north Wales. The billboard is placed in a spot where it can hardly be seen, like a tree falling in a forest with no one around to hear it fall. Placed in a surrounding where it is likely not to be seen by anyone evokes questions to its purpose of being there. 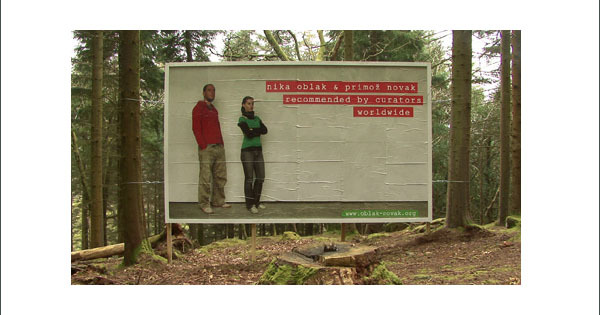 Additionally, use of an appropriated advertising line ‘Nika Oblak & Primoz Novak – recommended by curators worldwide’ is a self ironic reference to marketing contemporary artists as brands. Going South is a fictional documentary based on an actual Guinness World Record. 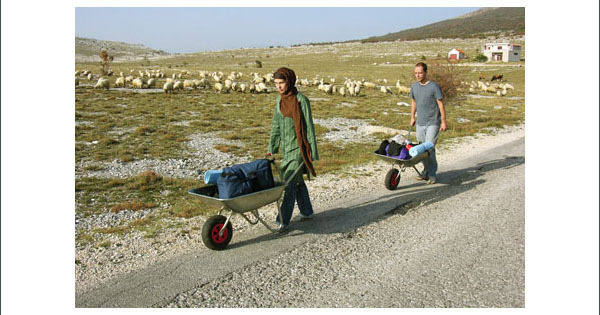 It presents stages of a fake, fabricated story about how the two of us achieve a world record by pushing wheelbarrows from Ljubljana to Sharjah for 14.500 km in 3 years and 12 days. The fictional documentary is a continuum of our exploration of media and capital driven society, exposing the media spectacle, and obsession with success and fame. It addresses the issues of global warming and environmental problems, however in a context of cliché media representations. The fictional documentary intrigues the viewer to deal with his/her relation to the general perception of information, which is being conveyed to us by the media on daily basis.